Rainbow time has arrived! Our gorgeous new diy prism rainbow mobile is hanging in the window, and rainbow happy hour in our apartment is currently from about 3 to 6 pm. I mean, check out the joy in this video … don’t you want that for your kids?? I ordered a selection of small prisms, both teardrop prisms and ball prisms . They were inexpensive, so I went a little overboard, but the zillion dancing rainbows improve my mood so much I have no regrets. Kiddo found the perfect branch in the park. It is nice and long and has some great curves for visual interest. We bought some hand-dyed beads and rattail cord (which were both more expensive than the prisms!) at a local craft store. You want to make sure your cord is not too thick for the beads. We did have a problem with that and my son got a bit frustrated when it came to threading the beads, so I gave him strong red thread on a needle, and that was easier for him to manipulate. Cut pieces of cord or thread to the desired length; too long is better than too short since you can always shorten them later. Loop the cord or thread through the prism and then slide on a selection of beads so they rest on top of the prism. 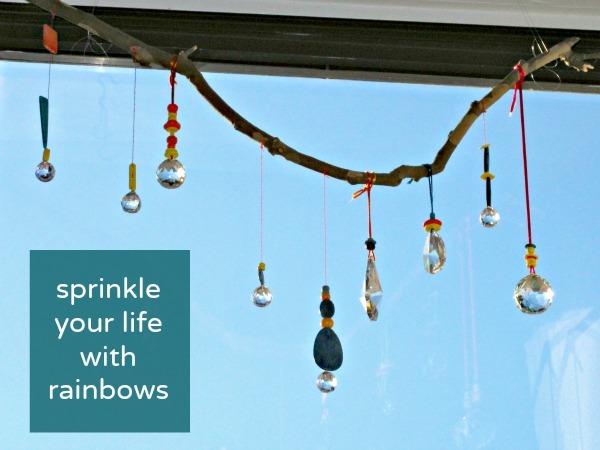 Make as many hanging prism and bead combinations as you like. 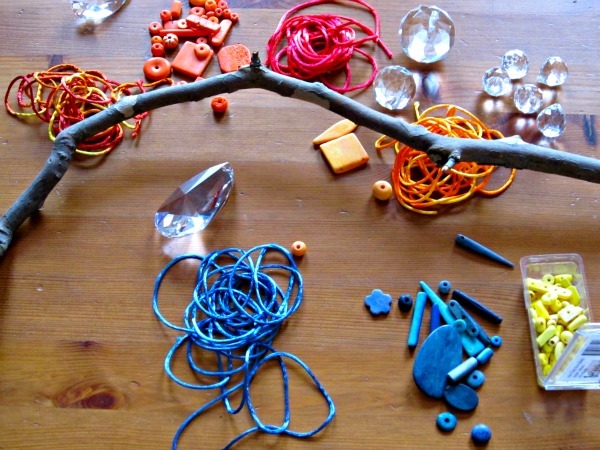 Although your child may need help with the fine motor skills portion of this crafty activity, don’t forget to let go of control and allow your kids decide the design! After all, you want them to feel ownership over the prism rainbow mobile, and the activity will be much more meaningful for them if they feel that it is actually theirs. After you’ve made as many strings as you want, secure them to the branch at varying intervals. 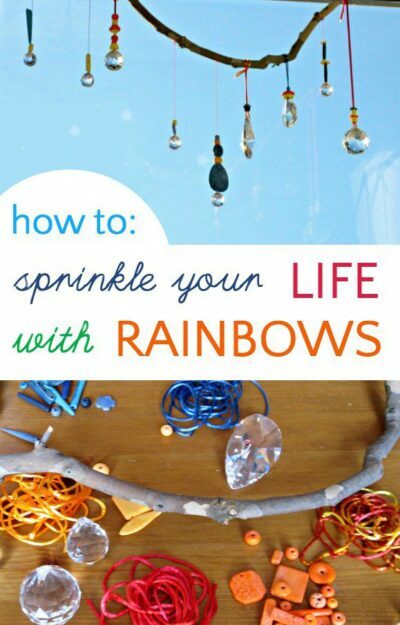 Tie loops of invisible thread at each end of the branch and hang your gorgeous rainbow prism mobile from ceiling hooks. When the rainbow mobile creates colorful joy all over your living room take a bit of time to discuss the science of how that happens. When the sun shines through the prisms, we all get a little giddy and you will, too! Gorgeous – my boys would love this! BTW the Stink Moody books have been a huge hit with my 7 year old, thanks so much for the recommendation. Oh, yay! I love Stink. He’s a bit silly, but I can’t help but laughing when I read his tales. Awesome! My son loves this. Thank you! Beautiful! Reminds me of the movie Pollyanna. I’ve always wanted to do this, thanks for the inspiration! Just ordered some vintage prisms from Etsy. Oh, yes! Pollyanna! I hadn’t thought of that.